Onboard Systems International, Inc., announced that its replacement cargo hook kit for the Airbus Helicopters AS350 aircraft has been certified for use in India by the Directorate General of Civil Aviation (DGCA). A letter of acceptance was issued for the installation of Onboard Systems cargo hook equipment covered under FAA STC SR00886SE for use on the AS350B, AS350BA, AS350D, AS350B1, AS350B2, AS350B3, and H125 model helicopters. With thousands of units in operation worldwide, Onboard’s cargo hook kits have a long and proven track record of safety and reliability. 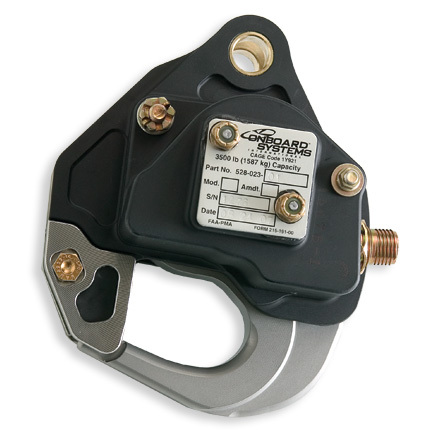 This particular AS350 replacement cargo hook kit enables operators to retrofit their existing OEM swing frame with Onboard’s signature TALON® LC Keeperless Cargo Hook. The advanced technology built into this cargo hook allows it to work with a variety of load ring sizes and styles while eliminating the possibility of losing a load that inadvertently slides past the keeper. A trade-in credit may also be available; please contact Onboard Systems for more information.